In selecting my initial site for the First Annual Blogger Bioblitz, I decided to eschew New York City’s more popular wildlife viewing spots. This weekend, the first truly magnificent one of spring, promised battalions of birders at locations like Jamaica Bay, Central Park, Prospect Park, and Jones Beach. But while other people were ticking off excited, unexpected arrivals, I wanted to see if Riverdale Park, the stretch of woods closest to my house, could keep pace with other, more thoroughly audited areas of the city. My initial suspicions on that score were less than favorable. Riverdale Park is a greenbelt extending the length of the northwesternmost portion of the Bronx, and this NYC as a whole. This narrow wood ascends steeply from the bank of the Hudson River, right at the edge of the Metro North railroad line named for that magnificent waterway. Though I’ve uncovered a number of interesting migrants and breeding birds in the park over the last few years, I cannot seem to will such a thin, uncomplicated strip of land to turn into a world-class birding spot. My survey this weekend turned up plenty of the expected species. Countless European Starlings and Common Grackles competed to determine which species could utter the most inexplicable, garbled songs. Either a Blue Jay, American Robin, Mourning Dove, Northern Mockingbird, or Northern Cardinal lurked behind every budding bush. Hardy winter residents like Black-capped Chickadee, Tufted Titmouse, and White-throated Sparrow were readily available as well. There were American Crows and Turkey Vultures and Mallards and Herring Gulls, just as one would expect from any stretch of NYC riverside park land. And yet, spring did come to this private wood. Hermit Thrushes appeared, perhaps not in the throngs they turn up in Central Park, but in decent numbers. An Eastern Phoebe advanced along the trail about twenty feet ahead of me, while a single Brown-headed Cowbird stayed up by the blacktop. Woodpecker species included not just the regular Red-bellied and Downy, but a handsome Hairy as well. Best of all, the woods did yield up warblers, the signal songbirds of spring. Neither Pine nor Yellow-rumped turned up, though great masses of the latter must be poised to descend upon the park, as they essentially own this area from April through October. 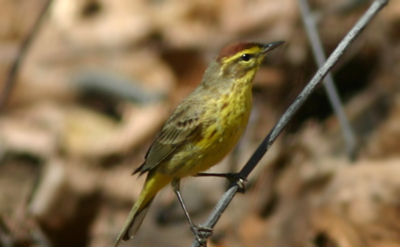 Palm Warbler, on the other hand, did make the scene. All four I spotted were foraging quietly on the ground as these birds are wont to do in spring, seeming to avoid flight as much as possible. But each bird, brown and brilliant yellow with its rufous cap and wagging tail, assured me that Riverdale Park was not a bad place at all to greet the first wave of migration. It should come as no surprise that my BioBlitz is bird-heavy. I’ve always followed the mantra of “go with what you know” and, besides, there wasn’t much more in the way of fauna to observe. I recorded countless Eastern Gray Squirrels, including an abundance of New York’s prominent melanistic morph. Of invertebrates, I noted only Cabbage Whites and bumblebees, though I don’t know which Bombus species frequent the Bronx. I’m even worse with flora than I am with the lower classes of fauna. The only flower of note was a profusion of ragged blue blossoms that I think may be a species of Blue-eyed Grass, though I can’t get any further with an identification than that. I aspire to one day be a better BioBlitzer! By the time next year’s bioblitz rolls around, I expect you’ll have plenty more plants and critters to list. I’m not that great a birder, so that’s one area where I’ll have to concentrate on for next time! Thanks, Bev. Your ID links have already helped me expand my taxonomic horizons!